36" Hand Hammered Rustic Matte type 316L Stainless NexGen Sink. NexGen is the next generation in workstation sinks. This is the most advanced kitchen sink design on the market and will outperform any other sink - period! Up until now, workstation sinks (including my Signature Series) had a "step" that held up the accessories. 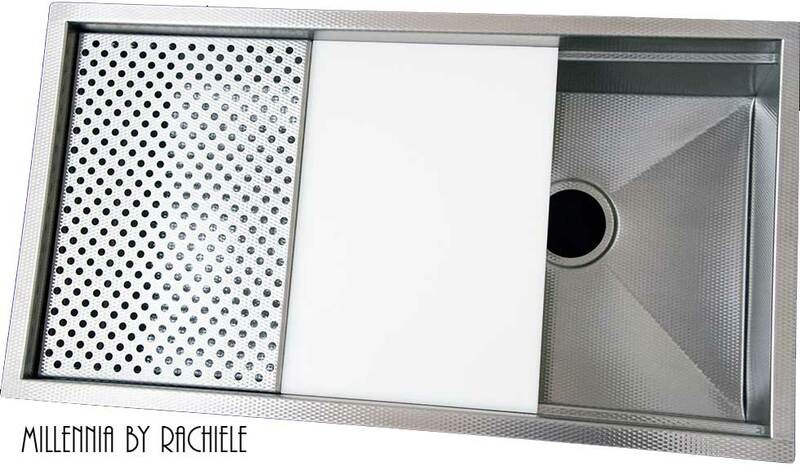 My new innovative design removes the step and introduces a small ledge. The sink width remains the same at the bottom as the top. This innovation gives the user an extra inch of front to back space in the sink with this option. My design gives 34 square inches of additional space inside a 36" sink. You just might fit your outdoor grill inside the sink! Check out the accessories shown in our copper NexGen sink in the video. They are all available in our stainless workstation sinks. Watch the video to the left to see all of the options available for our NexGen and Signature Series Sinks. Every stainless sink we make is custom designed to suit your handedness, height and style of cooking! Custom Luxury Sinks at the price of mass produced Luxury Sinks! I offer three very different types of stainless steel for our sinks - all of which are type 316 Marine Grade Domestic Stainless. First, we have the traditional brushed stainless. Secondly, I have a custom finished stainless called Rustic Matte (Super easy care). Thirdly, I have Millennia - a stainless with an embossed pattern that hides scratches and water spots. 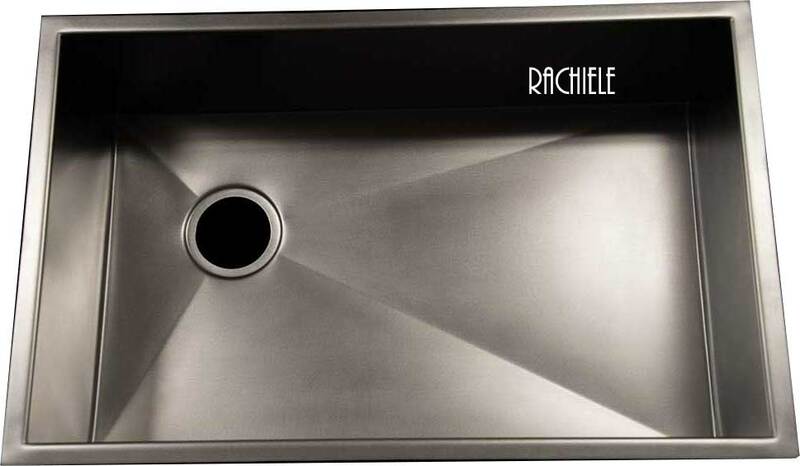 I also manufacture the most ergonomically efficient stainless steel sink on the market. Single bowl, rear corner drain sinks are the sinks of today. My Original Signature Series Workstation Sink Architecture, with steps to support drain grids and cutting boards are designed so you can do all of your food preparation on the sink instead of on the countertop. 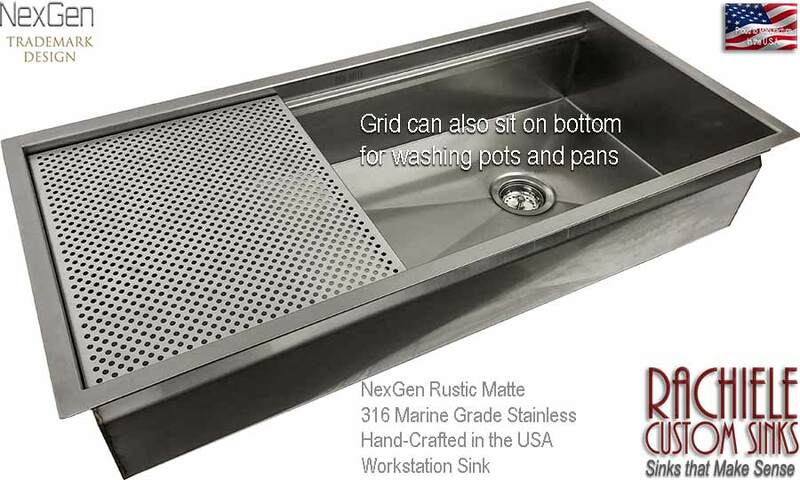 Click on the image below (left) to see a custom 48" NexGen Series, Rustic Matte Stainless sink with several accessories. Below middle, is a Millennia Signature Series under mount sink with an offset drain and a Waterstone Gantry Faucet suite. 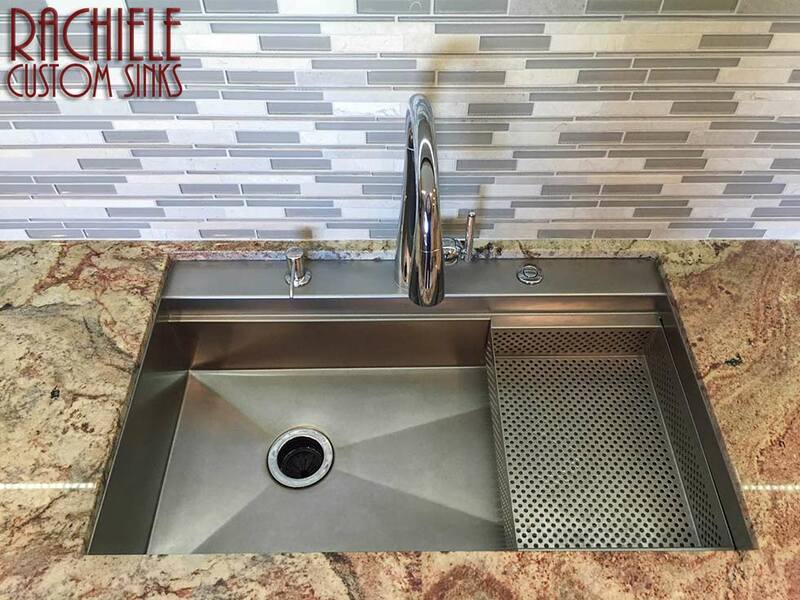 To the right is a 42" stainless undermount NexGen Workstation sink shown with a 15" grid.. In my opinion, the NexGen design will outperform any other design on the market. Millennia undermount sink with Waterstone Gantry faucet suite. 42" NexGen undermount stainless sink. All of our stainless sinks are custom made to fit your lifestyle, handedness, height and the way you prepare meals and clean up! These are some of the under mount stainless sinks we have built. The big value in our sink design is the rear corner drain and the optional Signature Series steps or the new NexGen ledges and accessories. We use only domestic stainless in our manufacturing. 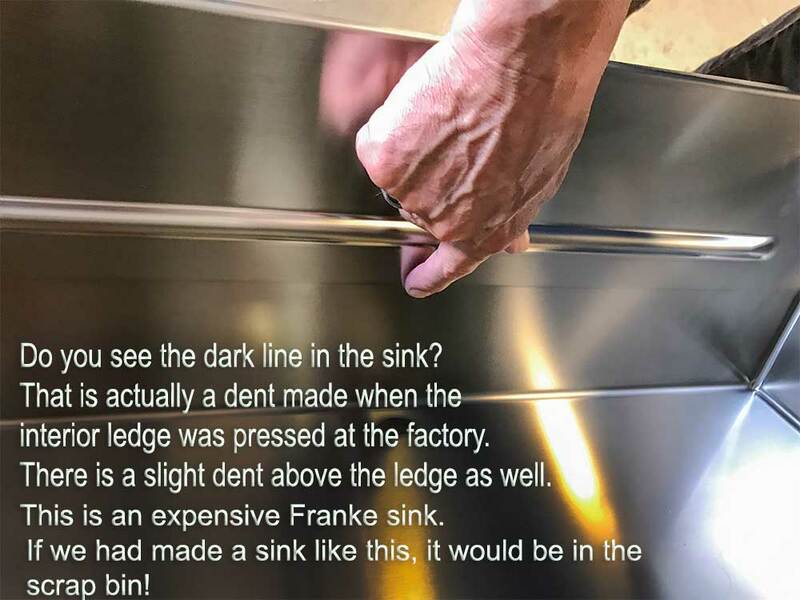 Ask where your stainless is coming from when comparing sinks. You might be surprised to find the stainless comes from China! Drag your mouse across the below photos to see all of them. Click on photos for larger image. 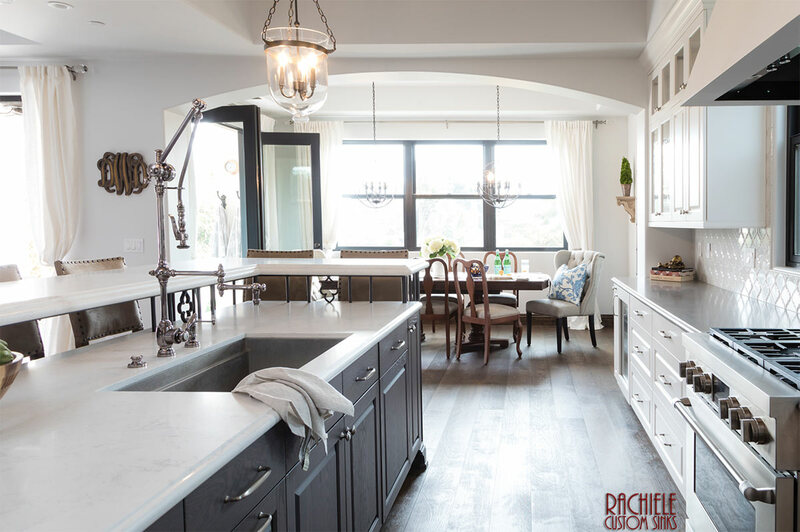 Rachiele under mount hammered rustic matte stainless steel workstation kitchen sinks are all built one at a time - fully custom. If you are left handed, you deserve a left handed sink. Rear corner drains allow you to wash on one side and set off on the other - while offering the ability to have one large bowl. Best yet, the drain is not in the way when washing large items. Workstation sinks allow you to do all of your food prep on the sink! Under mount double bowl stainless steel sink with drain board and a rear deck for a faucet and soap dispenser. This type of sink is very expensive and difficult to build as a custom sink. 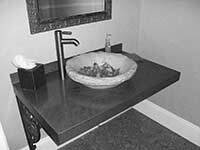 Hence, you will not likely find other custom manufacturers offering a drain board sink. Expect to pay upwards of $5,000. A bit less in the Rustic Matte finish. Large under mount stainless steel Signature Series Workstation sink featuring a Waterstone Gantry Suite. Hammered Rustic Matte Signature Series Workstation Sink - showing our sponge caddy. This under mount brushed Rustic Matte Stainless sink has a rear deck so the faucet and accessories are built into the sink. This type of sink is also often seen as a top mount sink. The sink is shown with our strainer basket option. This is a workhorse of a sink! The Millennia texture helps to hide scratches and water spots. The Signature Series option allow for total food preparation within the confines of the sink. No more messy countertops. In fact, I bet you will only be dusting your countertops from now on! This is a gorgeous option that can also be hammered. Our Hand Finished Rustic Matte Stainless sinks are easy to care for and happens to look exactly like Zinc. 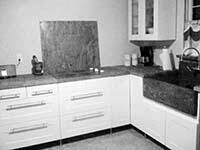 Scratches can be buffed out with a grey Scotch Brite Pad (we include with each sink). You can keep your sink looking brand new for decades! This is an under mount, hammered brushed stainless steel Signature Series sink showing 12" stainless grid. The sink is hand made of 16 gauge stainless steel. I offer a lifetime transferable warranty on all of my sinks. They are made right here in Apopka, Florida. This is a hand hammered rustic matte stainless steel under mount custom sink. The hammering is done by hand and can take upwards of 5 hours to hammer a sink like this. We hammer both sides. There is no other sink on the market with the functions and benefits as offered in my NexGen Sink Design. 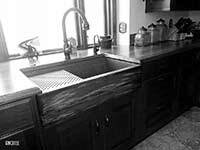 This is a Custom 48" Under mMount Rustic Matte Stainless Steel Sink in 316 Marine Grade Stainless. Marine Grade insures the ultimate in corrosion resistance. This is a triple bowl under mount stainless sink with our proprietary Rustic Matte finish. This sink is being used in a laundry room. We built three grids to allow for placing or folding clothing on the sink. This sink measured 48" long and was 10" deep. This sink was built for a well known celebrity. 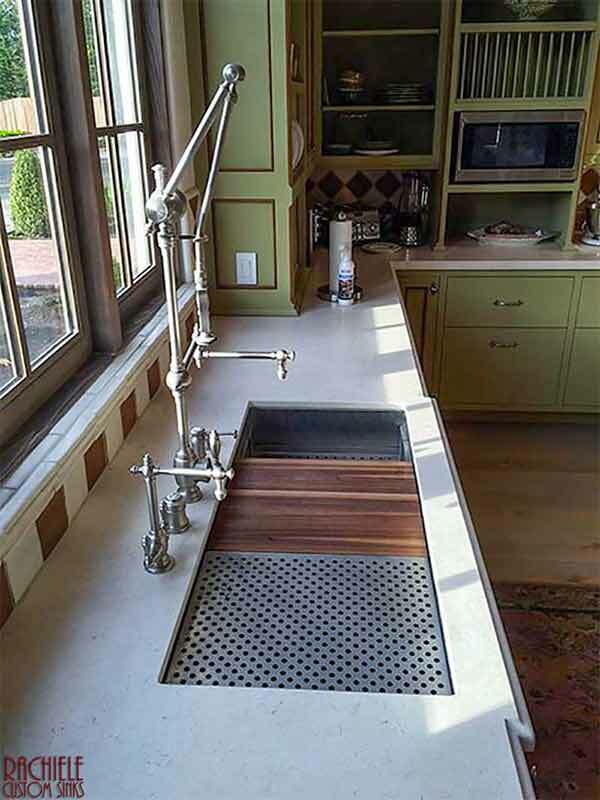 This is a Custom Made Rustic Matte Hand Finished stainless workstation sink with our drain grid shown on the ledge. This type of stainless is so easy to care for. This is the same sink as seen two images to the left. A sink like this takes an extreme amount of time and engineering. There is a tremendous amount of welding required and stainless has a tendency to warp when welded. Due to the complexity and time involved in building a custom sink like this, the price would be quite high. Get out the paddles to jump start the heart. This is one of our hammered brushed stainless steel under mount Signature Series sinks showing an American Black Walnut cutting board. 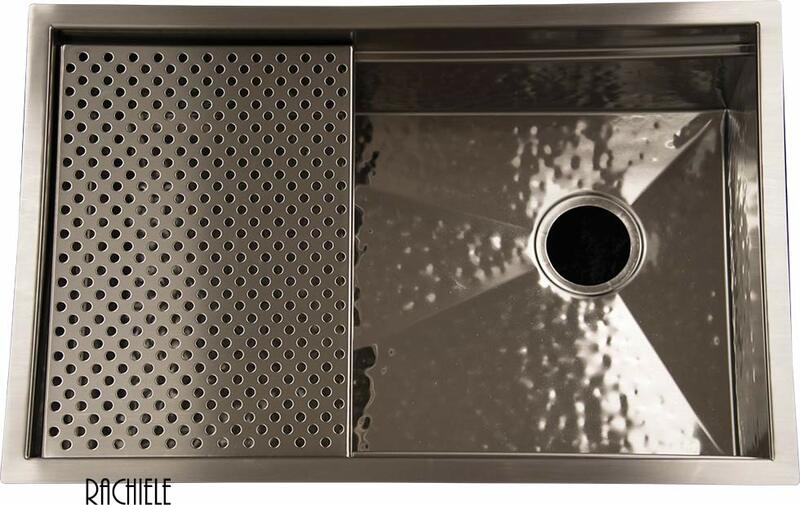 You can also order a stainless matching grid accessory and a sponge caddy for these sinks. 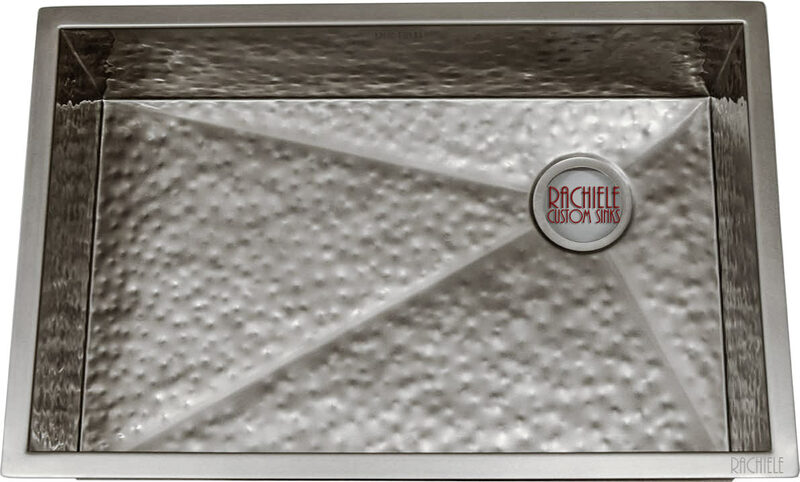 Click on the photo to the right>>> This is just one example of the difference between the quality standards of a Rachiele sink and most others. 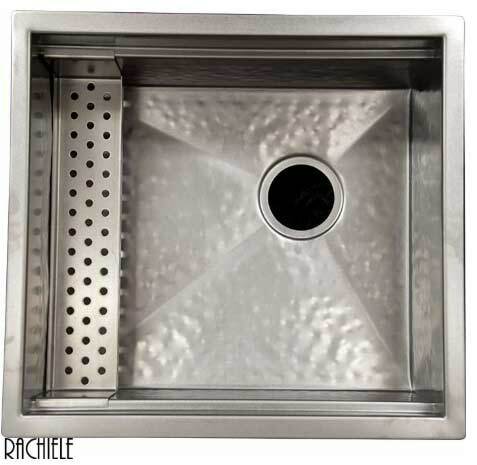 The retail price on this Franke PKX11028 28 3/4" sink is $2399. My Signature Series (a much better design) sink sells for slightly less than the Franke sink! (October 2018) What other "Luxury Brands" pass off as first quality would be put in our scrap bin. We would not even sell a sink with that much of a defect as a second at any price. As a matter of fact, we had a sink with a defect so small that 99% of the homeowners would never notice it. Not only did we build another for that customer, we did not sell the defective one. Nothing leaves here that is not the absolute best we can do. I understand other manufacturers must sell to distributors, who then sell to dealers, who then sell to the public. What I don't understand is how we can build a better sink, by hand, and offer it for the SAME PRICE! I have been told that a great deal of stainless sinks are being imported from China. I am very careful about making comments where I do not have first hand knowledge, therefore, I will let you know that the following information was gleaned from a friend in our industry. He told me that he thought he could make "a ton" of money selling stainless sinks that he was importing from China. He showed me photos and his cost. I was shocked at how nice the sinks looked and the low price he was getting them for. About 8 months later, he called me and said he had to stop selling the sinks, as he was getting numerous calls from his customers complaining of rust inside the sinks. Moral of this story...Make sure you know where your sink is made and what kind of warranty you will get. Would you go out and buy a first generation cell phone today? Why consider a sink designed for the 20th century when you can invest in a sink designed for the future? We design sinks that make sense! Designing the most efficient sink possible has been my passion for decades. After over 20 years of research, prototypes, great designs and 10 patents, I believe I have finally designed the Ultimate Sink: NexGen. Shop Now!